Today’s Flash Back Friday comes from Episode 197, originally published in December 2013. 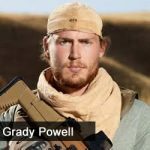 Grady Powell is the former Senior Detachment Weapons Sergeant in the U.S. Army Special Forces and formerly with the United States Army Special Forces (Green Beret). He’s now a firearms and survival instructor. He joins the show to tell us about the National Geographic Channel’s “Ultimate Survival Alaska” show. He shares tips for cold weather survival and explains the survival training he provides.